Large debris avalanches are characterized by extremely rapid, flow-like motion of large masses and they travel extremely long distances showing much greater mobility than could be predicted using frictional models. In order to investigate the mechanisms involved and the reasons for the large propagation of these phenomena a discrete element model (DEM) and a combined finite and discrete element one (FEM/DEM) are used to simulate small-scale laboratory experiments carried out by Manzella “Manzella and Labiouse (Rock Mech Rock Eng 41(1):133–151, 2008, Eng Geol 109(1–2):146–158, 2009, Landslides, 2011 submitted); Manzella (Dry rock avalanche propagation: unconstrained flow experiments with granular materials and blocks at small scale. Ph.D. n 4032, Ecole Polytechnique Fédérale de Lausanne, Lausanne, CH, 2008)”. 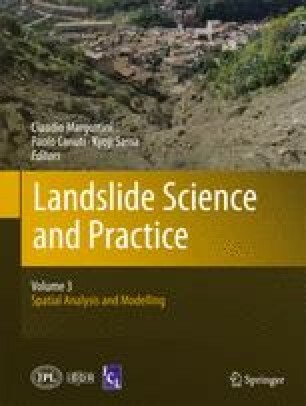 The combined use of different models produces a more complete study of the phenomena since each model can fill certain gaps of the other; they also help in a better understanding of some mechanisms and factors, which are important in the longitudinal propagation of granular and block flows, such as the progressive failure, the initial block packing and the topographical characteristics of the slope break. Dr. Manzella would like to thank “Fondation Ernst and Lucie Schmidheiny” for funding and Professor John Williams and Professor Costanza Bonadonna for fruitful discussions. Dr. Grasselli’s work has been supported by the National Science and Engineering Research Council of Canada in the form of Discovery Grant No. 341275.